The book contains 180 pages, including a complete list of the author's prints (with numbers of blocks and impressions listed for each), 7 colour plates of his work, 5 colour plates showing the progress steps for making a print, and numerous other illustrations. 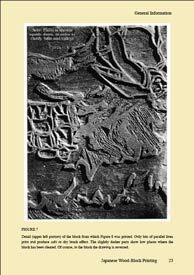 Description: this book contains everything one could possibly want to know about Japanese wood-block printmaking as it was practiced in the first half of the 20th century. It should be of intense interest to woodblock printmakers both experienced and novice, artists in other media who wish to approach woodblock work, and anybody with an interest in the 'art of the woodblock'. Mr. Yoshida was one of the most important woodblock printmakers of the 20th century, running a workshop for many years in which hired carvers and printers worked on the making of his prints. These men were top professionals, and Mr. Yoshida describes their work in detail in this book. 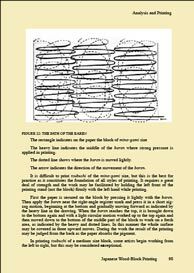 But the book is not just about technique; he also goes to great lengths to explain his philosophy of printmaking, and the process by which he turned his artistic conceptions into finished woodblock prints. In the ten years since I obtained my own copy, I have read it and re-read it many times, and every time I do I understand more of what I am reading. It is no cliche to say that it will take you a lifetime to understand the contents of this book. 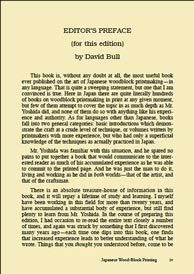 About this eBook: The book is identical to the original version published by Mr. Yoshida in 1939; nothing has been omitted. As an improvement to that print version, the images of his prints in the Appendix, which were at that time reproduced in greyscale, have here been included in full colour. This pdf version also contains a complete set of 'bookmarks', allowing you to jump directly to any section that you wish to read. In addition to these bookmarks, the Table of Contents within the book itself is also 'hot' - clicking on any item will jump you to the corresponding page. To provide even deeper access to the information presented, the entire text of the book is accessible with the 'search' function of your pdf reader. 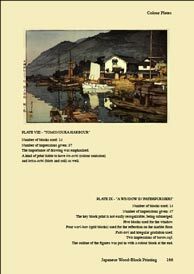 Note: More information on the Mokuhankan eBooks - their format, how to use them, how to download them, and other relevant details, along with a free download sample you can inspect - can be found on this page.